Hinckley Yachts finished in the top two spots in the 5th Annual Elf Classic Yacht Race last weekend. The race, named for the 30-foot racing yacht Elf, built by Lawley & Sons in 1888, benefits the Classic Yacht Restoration Guild. The CYRG is currently undertaking a complete restoration of Elf in its mission to educate those interested in preserving traditional yachts. The boats participating in this weekend’s race started at the Eastport Yacht Club in Annapolis, Maryland and ended at the Chesapeake Bay Maritime Museum, now celebrating its 50th anniversary. 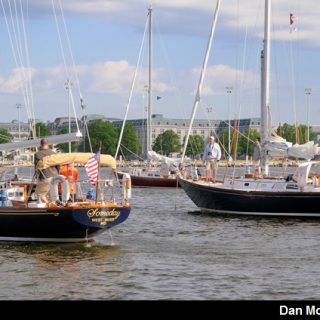 Of the thirteen boats that participated in the race, 7 were Hinckley Yachts! Richard and Eileen Rosenthal came in first on their Bermuda 40 MK III sloop Someday, followed by Mariana and Pete Lesher in second place on Esperanza, a 1963 Custom Yawl. Multiple Hinckley Yachts have sailed in this event in the past and we’re sure they will continue to for as long as the race is run. If you’re interested in participating in other classic yacht regattas on your Hinckley, please consider the Corinthian Classic Yacht Regatta August 8-9 in Marblehead, Massachusetts. As an added bonus to the fun you’ll have during this casual race, Hinckley owners that partake have a chance to win the Hinckley Yacht Trophy which is awarded to the best overall performance by a Hinckley and comes complete with a $2,500 service credit at any of our six service locations!